Kyle Martin was industrious in the centre square on Friday night. Collingwood was committed but ultimately outclassed by Geelong's VFL team in its 43-point loss at Kardinia Park on Friday night. It took the ladder-leading Cats three quarters to shake off the persistent Magpies who refused to roll over every time it appeared as if the home side was about to kick clear. But once the dam wall burst, the goals flowed with ease. Geelong kicked six goals to two in the final quarter after jagging two late majors in the dying stages of the third quarter just as it appeared as if Collingwood might take a lead into the final change. Recap collingwoodfc.com.au’s coverage of Friday’s match here. Constant rain ensured that the match was dominated by the big bodied midfielders of both sides, although Geelong’s key forwards remained dangerous all night long. Kyle Martin bulldozed his way through the four quarters, winning 34 possessions, laying 16 tackles and applying two smothers. He received good support from fellow first-year pair Ben Kennedy (28 possessions) and ruckman Brodie Grundy (17 possessions, 30 hitouts) who ensured that Collingwood was competitive in the centre square during the first three quarters. 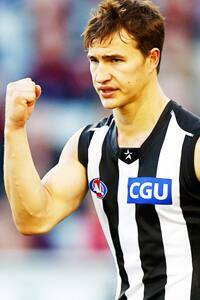 Grundy’s game illustrated just why Collingwood fans are justifiably excited by their latest ruck prospect. The 19-year-old won 30 hitouts against the accomplished Trent West and Nathan Vardy and managed to have an influence at the stoppages around the ground with his body work and ability to follow up at ground level. He became a threat when stationed in attack and he had the opportunity to kick at least two more goals to go with his solo effort (winning the hitout, roving his own tap, handballing to Ben Richmond before receiving it again and kicking quickly but accurately around the corner while being brought to ground 35m from goals) in the first quarter. Defenders Marty Clarke (24 possessions) and Jackson Ramsay (23 possessions) were solid contributors throughout and gave their side enough run and carry from the back flanks. Peter Yagmoor impressed with his ability to blend attack and defence and VFL-listed duo Jack Hellier and Jordan Collopy both had their moments of excellence. Of the more experienced players, Alan Didak steadily worked his way into some consistent form in the slippery conditions. He had six first quarter possessions and ended the match with a total of 18. He also kicked a trademark goal on the run, skidding the ball through from 40m early in the final term. Quinten Lynch played his first match at VFL level and overcame a quiet first half to have more of an impact while in the ruck in the second half. The side was without Lachlan Keeffe who appears to have been held over as an emergency for Saturday’s seniors game against Gold Coast. The other emergencies, Kennedy and Adam Oxley, both played against the Cats. Collingwood will look to atone against the Casey Scorpions at Victoria Park next Saturday at 12pm. The match will be a quasi-curtain raiser to the AFL match between Collingwood and Greater Western Sydney at the MCG which is set to start at 4.40pm. Last time the two sides met, the Scorpions gave the young Magpies a fearful 70-point hammering out at Casey Fields.